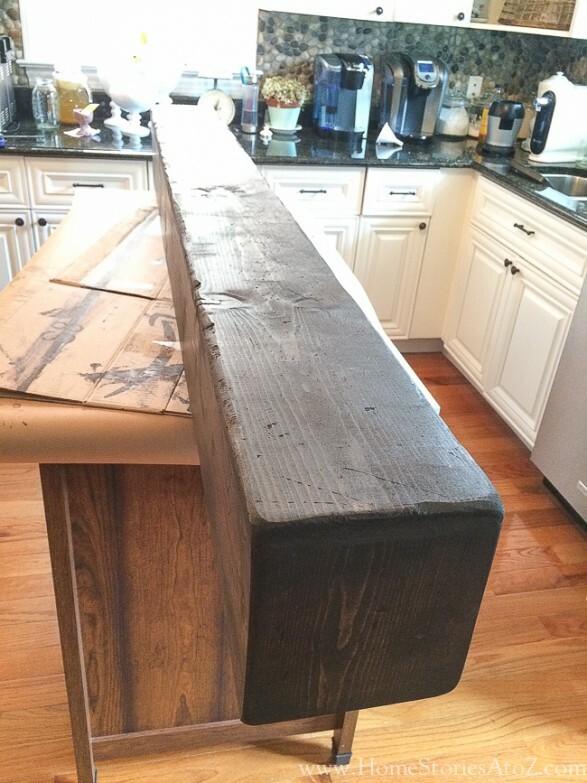 What do you do when your order for a beam mantel–that you really need STAT for a makeover–is mysteriously canceled? You forge ahead and make your own! 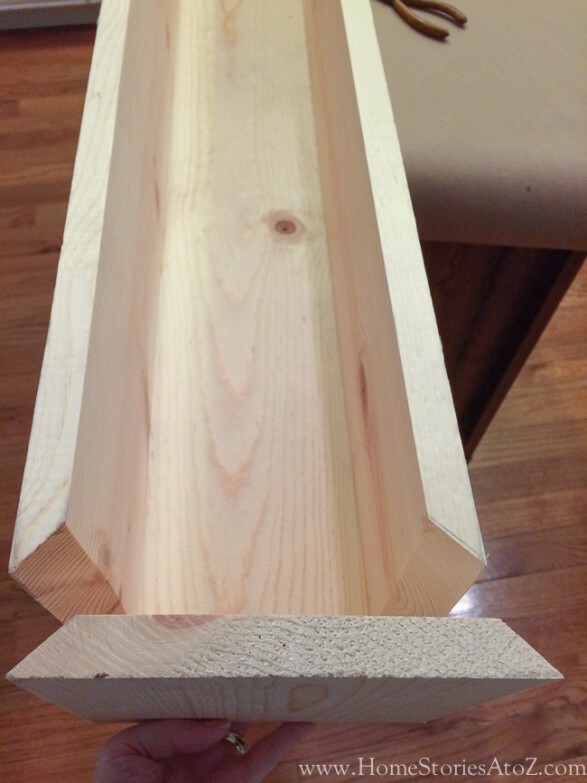 Today I’m going to show you step-by-step how to build a box beam mantel. 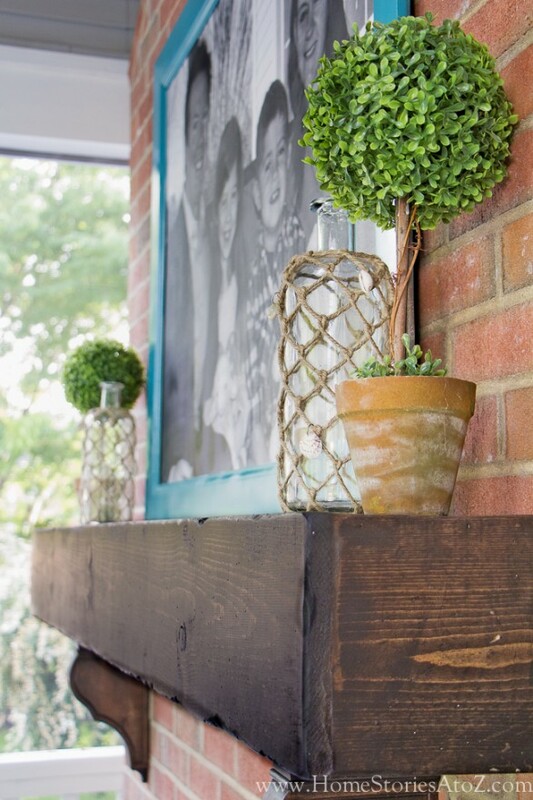 This mantel has the look of a rustic beam and is relatively easy and inexpensive to build. 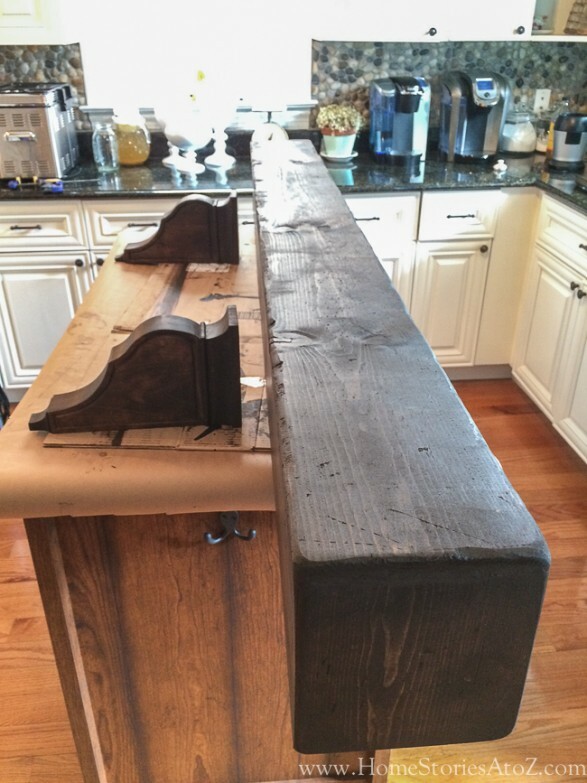 The back of the mantel is left open and hung on to the wall using a cleat. You can use decorative corbels to customize your look. 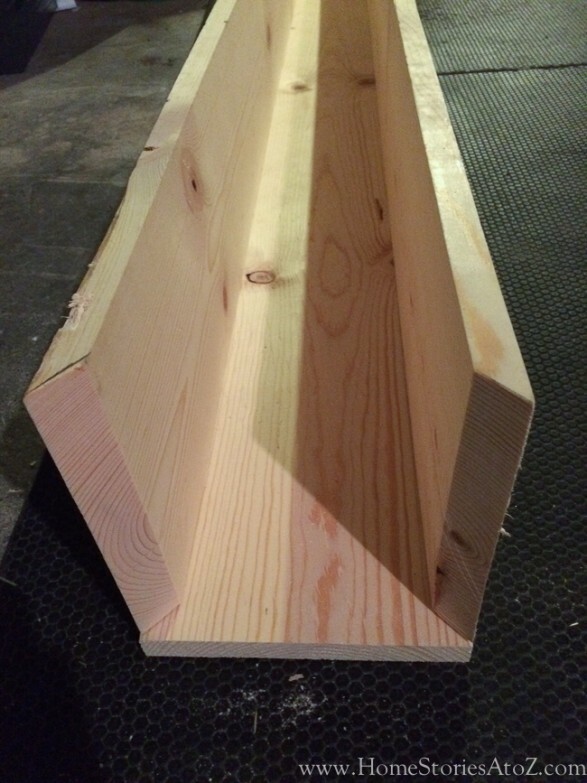 Step 1: Cut 45• miter cuts at each end on two of your 1x8x6 boards. You can use a table saw or a chop saw to make 45• cuts on the ends of two of your boards. I used my double bevel Dewalt saw to make the cuts. Step 2: Glue and nail the boards in place. This step is easiest done with two people, so grab a helper if you can find one! 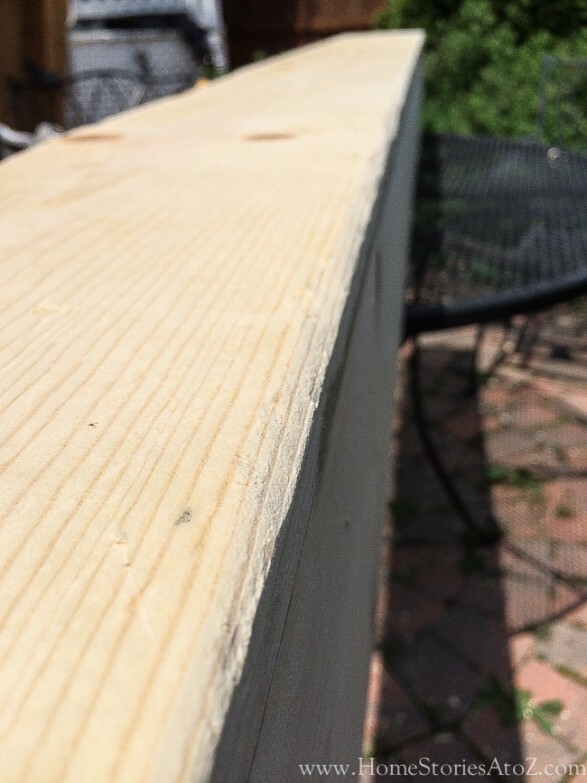 Place wood glue on the edge of your boards and nail boards in place. If you have clamps, use them to hold the boards in place until the wood glue dries. Step 3: Measure and cut your end caps to size. Make 45• cuts on two sides of your end caps. Glue and nail into place. The mitered end caps will give your beam a smooth and nearly seamless appearance. This looks much better than just using square cuts, but it is much easier than mitering ALL sides of your wood to create a truly seamless box. 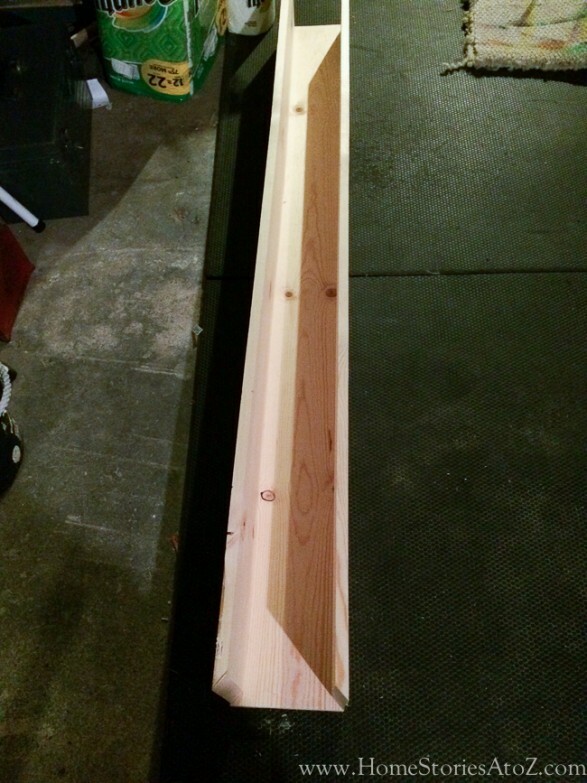 If you have a fantastic tablesaw, you could miter every side of your wood to create an even better looking beam. Step 4: Distress your beam. Distressing your beam is an important step towards creating a realistic look. I used a metal chain, chisel set, screw tip, hammer, and paint key to create faux wormholes, scratches, dents, and dings in my wood. The level of distressing is completely a matter of personal preference. I found chiseling chunks of wood off the sides of the mantel created the look I was going for. Step 5: Fill the wood seam with wood putty. 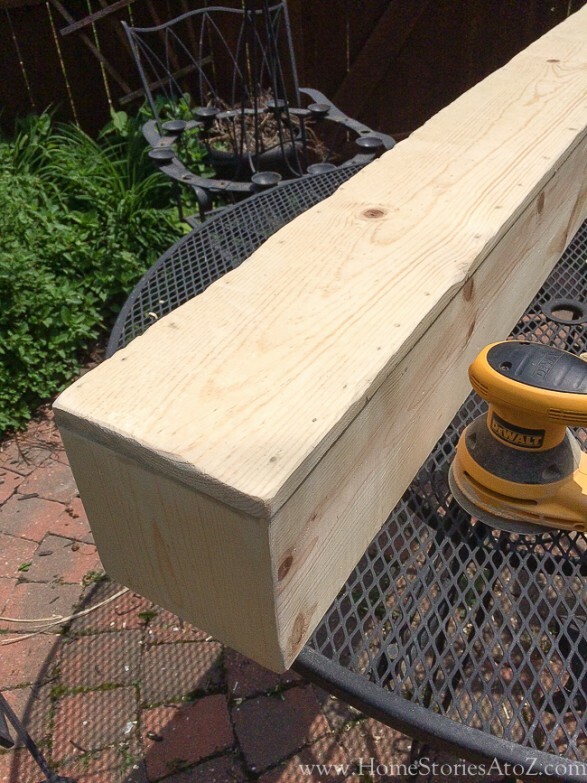 Step 6: Sand your beam. I used a coarse grit paper on my Dewalt orbital sander to smooth out my chisel marks and create further dips in the sides of my beam. I also rounded the corners a bit to give a more worn look. Step 7: Stain your wood following the packaging directions. I like to use disposable foam brushes to apply my stain. I simply brush on the stain, wait a few minutes, and then use a clean lint free rag to remove the excess stain. Once the stain is dry, apply several coats of poly leaving the appropriate dry time between coats. Hanging things on brick is one of my all-time least favorite activities! I live in a home with 100-yr-old brick walls in nearly every room, and while I love the look of exposed brick, it is not fun to drill into. I took advantage of having two strong men at my disposal and asked them to follow my instructions to hang the mantel. First, pre-drill holes into your cleat. Mark your holes on the brick, avoiding any grout lines. 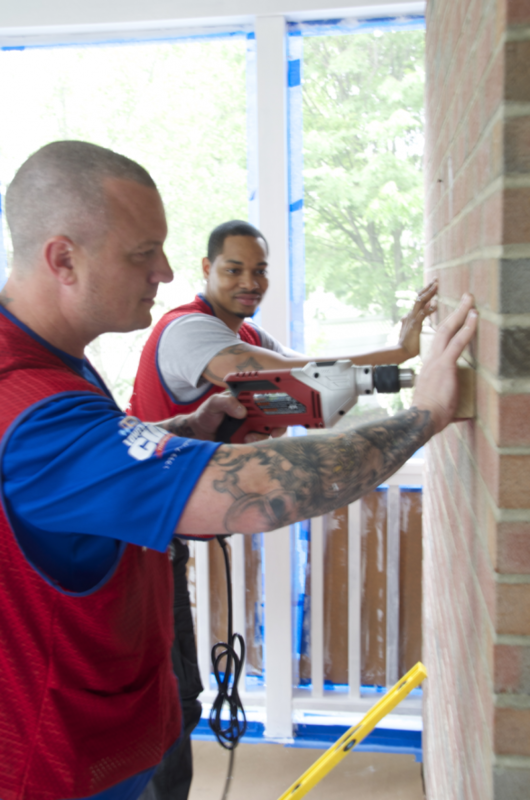 Use a hammer drill to pre-drill into the brick. Secure the cleat to the wall using Tapcon screws. Place the mantel over the cleat and secure the mantel to the cleat using wood screws. 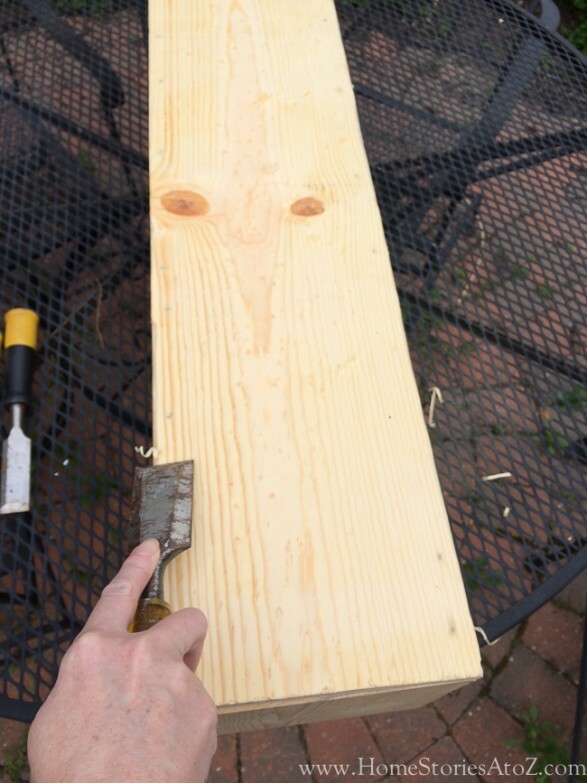 You can counter-sink your wood screws and fill the holes with putty and stain, or you can just let them be. If you choose black wood screws, they will not be very noticeable. Enjoy your handiwork! 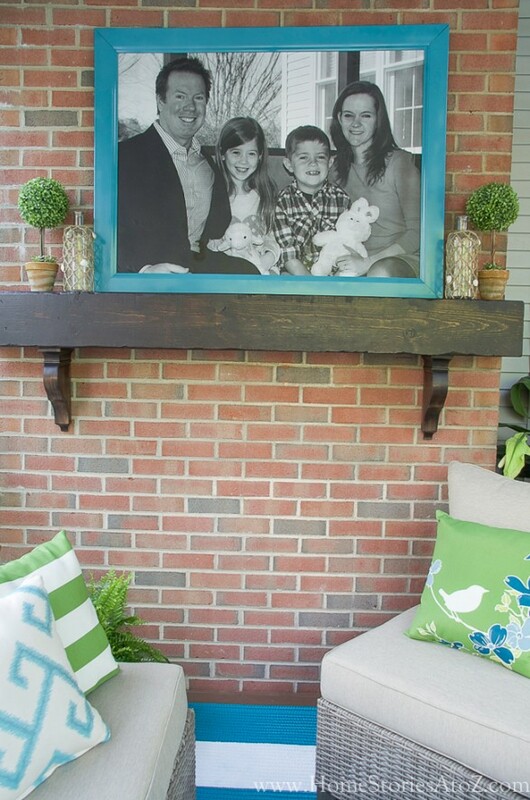 You now have a fantastic looking beam mantel! If you liked this post, you might also want to check out my related posts below. 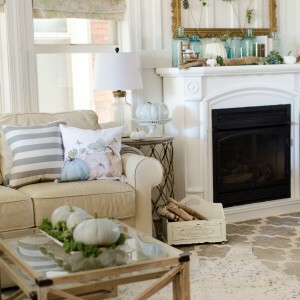 This post contains affiliate links showing you the products I used to create the mantel. Just finished mine. It turned out fantastic! Thanks for sharing all the details. 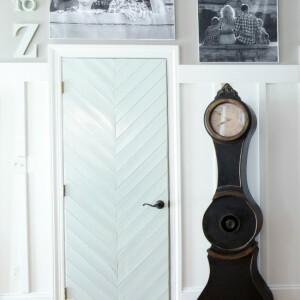 I am planning to make one of these to fit over my existing fancy mantel, we installed shiplap above our fireplace so we need a more rustic mantel! Where did you get the brackets underneath? Brackets? Do you mean the wood corbels? I found them at Lowe’s. They are purely decorative. 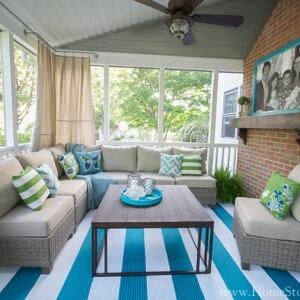 I think we had one of those in our last house and I just loved it! I miss having I and no room in our apartment now, but it is a good memory! Perfect timing! 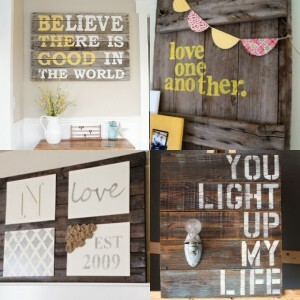 We just ripped off our old mantel this weekend, and this is just what I’m planning to do (minus the brackets). Pinned!